We haven’t written a blog post in three months, not since Sally received her last dose of chemo for her Infant Leukemia treatment in August. We continue to post short updates on Sally’s Facebook page, but have been contacted by friends and family not on Facebook asking how Sally is doing. Nicole will be posting an update detailing Sally’s recovery, but the short version is that our little girl has been doing great and Mommy/Daddy are crashing a bit after living through two years of an intense, ultra stressful and unpredictable lifestyle. The reason we’re writing is that today Sally experienced a major milestone, she had the port in her chest removed. If you recall, we had the port installed after the central line in her back kept getting infected. These devices are used both to deliver chemo/meds and draw blood. 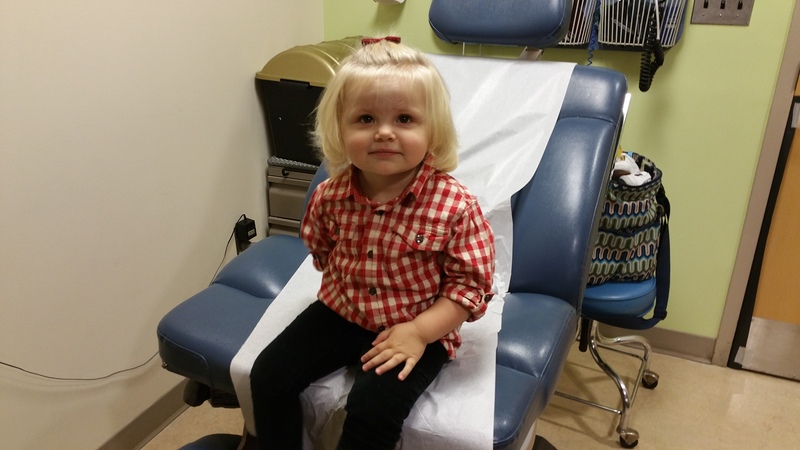 Originally, we were told the port would stay in for the first year after treatment due to the monthly blood checks and quarterly bone marrow aspirates. However, the team decided that since Sally has been doing so well that the risk of infection wasn’t worth it and wanted it out before we traveled to Florida this month for vacation. This has been met with mixed emotions by Nicole and I, it’s great to remove one more thing from Sally’s treatment, especially a foreign object in her body. At the same time, this means that Sally will be subject to finger sticks and IV insertions for the nine remaining months of tests. In the end, we decided to trust the team and move forward with the procedure this morning. Being back at MSK was strange for me personally, my first time in the clinic since Sally’s treatment ended. For two years being on that floor was a sense of comfort, a lifeline both for Sally and our family, and I always hated walking out the door back into “reality”. Being up there today, I was overanxious and uncomfortable. Reliving what we’ve been through on that floor, hearing a child screaming in the back, and seeing new kids battling cancer stirred up fears and emotions that I’ve pushed aside the last few weeks. I unexpectedly found myself in the position of struggling to hold myself together. In a way, I could not wait to get out of there and back to “reality” this time. When sharing these feelings Nicole remarked that she more felt like it was visiting family, popping in quickly and saying hello. We met with the team first, who confirmed that Sally’s counts looked “perfect” considering where she is post-treatment, her white cell counts are still expectedly lower than a normal healthy person. They were very happy with her progression from last month’s checkup. It was incredible to see Sally looking at pictures of herself on the survivor wall, a wall filled with pictures of kids who have finished treatment. There were times where we wondered if that day would ever come. Checking herself out on the Leukemia survivor wall. We then went into the procedure room, where there are typically four to five medical staff and is pretty low key. This time, we were greeted by a packed room of a dozen medical staff with a lot more urgency than we have been used to lately. Dr. Laquaglia, the much-respected surgeon who was the same doctor who installed Sally’s central line over two years earlier, appeared and would be handling the procedure. Once Sally was unconscious, Nicole laid her on the table and we quickly exited the room to leave the medical staff to their work. That’s when Nicole and I both broke down crying in the hallway. Even though it was a simple procedure and another positive milestone for Sally, seeing all of those medical staff in a room surrounding our little girl was a visual trigger that shook both of us. Seeing Dr. Laquaglia in particular was a trigger for Nicole, bringing her back to those first days after Sally’s diagnosis. As much as we adjust to our new “normal” by trying to put cancer behind us and look ahead to hopefully sunnier days, the sights, sounds, fears and emotions of the past two years still very much burn inside us. 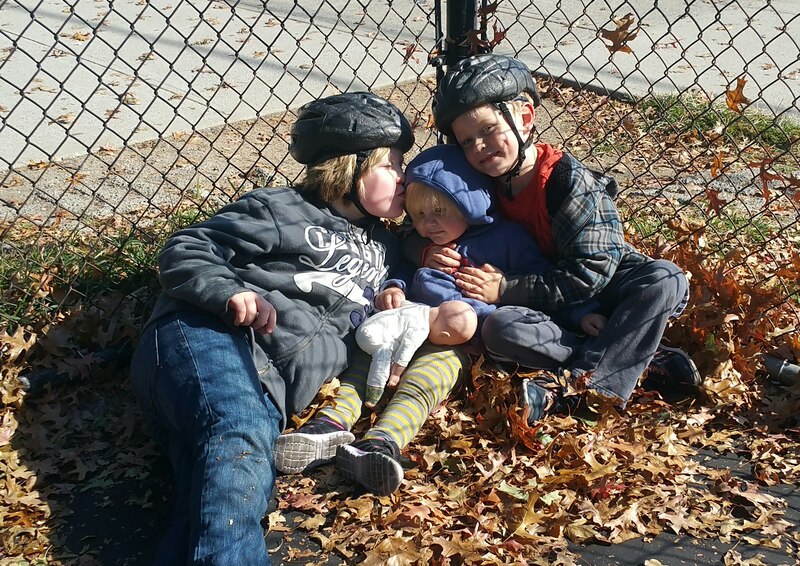 We continue to put on brave faces, refocus at work, and reenter a more social lifestyle, but those feelings and worries continue to lurk there and emerge every time Sally is unusually tired one day, falls down, or a bruise/mark appears on her body. We’re getting better at managing this, and truly are working towards life with cancer hopefully behind us. It helps that Sally has been doing great, she is really becoming a full-fledged and happy (and at times sassy) toddler. 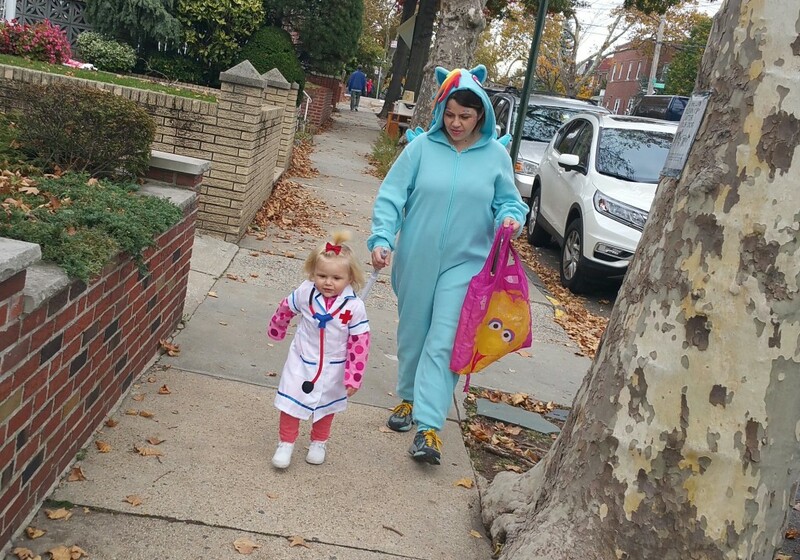 Last weekend she went trick-or-treating for the first time, dressed as a nurse of course! She receives a form of therapy almost every day at home or the local playground, sometimes several times a day. Although we still need to feed her via the feeding tube, her eating by mouth has been progressing nicely. She can now eat an entire egg in the morning, and took food from a spoon for the first time yesterday. Her favorite food is surprisingly broccoli, and loves chicken too. It’s an uphill battle, but Sally continues to improve. 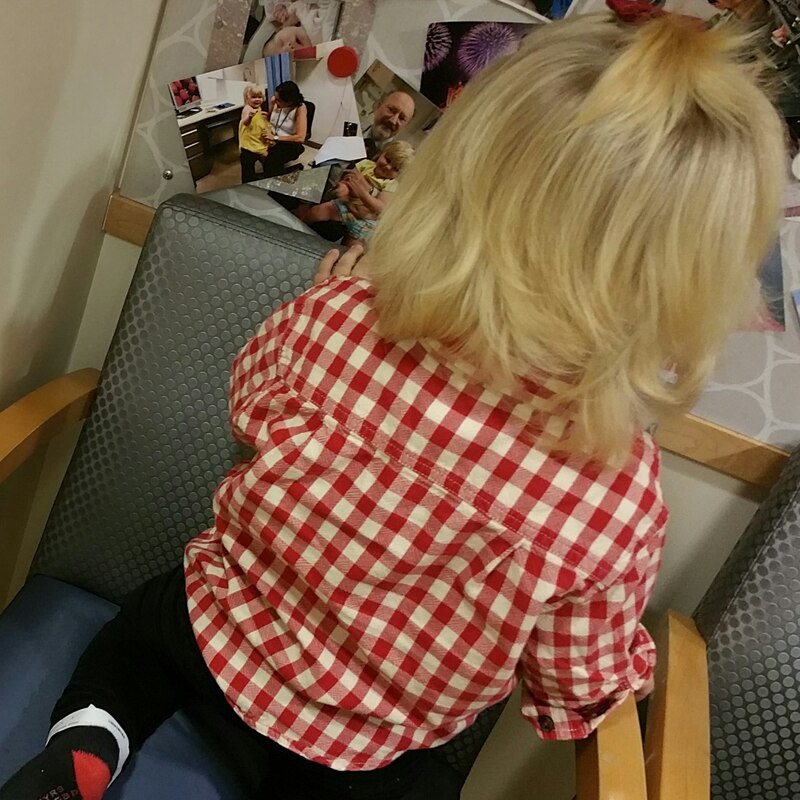 There is much more to say about Sally’s recovery, including her first visit to her new pediatrician, but will let Nicole share those updates in a separate post. Our little nurse was on a mission this Halloween. William pointed out that last year Sally’s leg was broken, but this year it’s not and she could help decorate the tree. In the meantime, thank you for your continued thoughts and prayers for our family as we continue down this new chapter in our family’s story. The procedure went well and Sally is home resting. 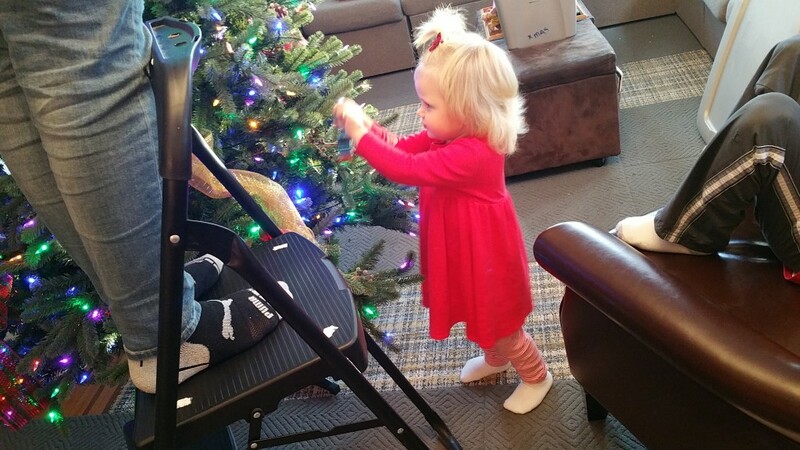 Knowing her, Trouble will be back up terrorizing our home shortly. Please keep Sally and all the families battling childhood cancer in your thoughts and prayers. Bless you all! Nothing brightens my day more than pics of Sally doing “normal” things. thank you so much for all your candor and sharing your feelings as you continue the transition from sick little girl to healthy little girl…pray for you all every day. A wonderful milestone in Sally’s future. She is “perfect” and adored by her brothers. Have a wonderful Thanksgiving (you have so much to be thankful for). I will continue to pray for Sally as she goes into the next step of her future. Enjoy this beautiful weather and sunshine. Wow. I am so happy for you guys. Has she been to a Bills game yet? So happy to hear that Sally is doing so well. the strain that the two of you have been under will continue to be with you for a while, but I am sure that the love and support that ha sustained you these past two years will still be with you as you move ahead. Love and prayers to all of you. you are always in my families prayers and I admire your courage and strength. Wishing you a fun & loving Holiday with lots of precious memories!! So happy to see Sally looking so good. She has grown since we last saw her at Breezy. Sally’s progress and ready smile makes us so very happy for the entire Kabel family. Amazing to see how much Sally has grown! So happy to hear this! I was hoping and praying for you all. She is simply precious! Congratulations on the milestone. Your words had me in tears and so very much like the time we had to lay out son down for his port removal also. Yes, the emotions and memories that these events bring back remind us that we are still healing from the traumatic time that has happened. Best of luck that you have continued happy news and that your journey through life is brighter and sunnier from now on. From one oncology family to another, we wish you the best. Hello Kables Family! I feel extremely happy to hear all the good news from you! Congratulation on gettinh back to normal. Enjoy it! It was good to see you Nicole with the kids at the supermarket!!!! Thank God for the blessing of this beautiful child’s healing. I love her hair!!!! That was an amazing post, so happy you’re moving on to better days! Sending all the love, well wishes, heartfelt prayers for a bright, healthy, happyyy future for you all xoxo! I’ve been following your blog from the beginning, and have learned so much. Today my very good friend’s daughter was diagnosed with lymphoma. I feel like I remember a post about how to be a support for a family going through a cancer battle, but can’t find it. Any suggestions on the best way to be a helpful friend? I want to say and do the best I can for them.